"I've often stared death in the face. I did not run from it. I did not fear it." A pilot's primary goal is survival at the expense of their opponent. This gives them plenty of latitude to do what they think is necessary to make it out of battle alive. Some pilots are more ruthless and cunning than others. Rán in EVE: Valkyrie #1 from Dark Horse Comics is one of those pilots. The issue is written by Brian Wood, illustrated by Eduardo Francisco, colored by Michael Atiyeh and lettered by Michael Heisler. Rán is the founder of the Valkyrie—the deadliest space-fighter pilots in the EVE universe. She earned that reputation through sheer intelligence and know-how, capitalizing on an uncanny ability to survive. She parlayed that survival instinct into a career as a well-known fighter pilot, something that may end up getting her killed. This series leads into EVE: Valkyrie and--as such--Wood spends plenty of time giving the reader information on Rán. Much of her backstory is told as narration by Rán herself, as she relays her take on certain key events in her life in a way that provides the reader plenty of context for her current reputation. Wood infuses the issue with hints of Ender's Game and Top Gun throughout in an effort to cast Rán as a piloting prodigy. Because of the origin nature of the book though, Wood can't really prevent it from being what is essentially a crash course on Rán's life. That's not to say it's not an interesting read as Rán is a character with plenty of interesting features, but the work does feel a little scattered at times. Capturing the frenetic energy of space battles is Francisco, who inserts shots of the pilots amidst shots of the actual combat. The effect is that the reader gets a better sense of what's going on and the combat feels fast. The non-combat scenes feel a little looser, as they lack the tightness that Francisco provides to the other panels. Rán throughout her life bears enough resemblance across ages that the reader clearly knows it's her though. And Francisco does give the planetary scenes enough of a cultural flair where it gives the reader a sense that Rán is a woman of the galaxy. Atiyeh's colors feel fairly bright throughout, which adds extra emphasis to the space combat sequences. 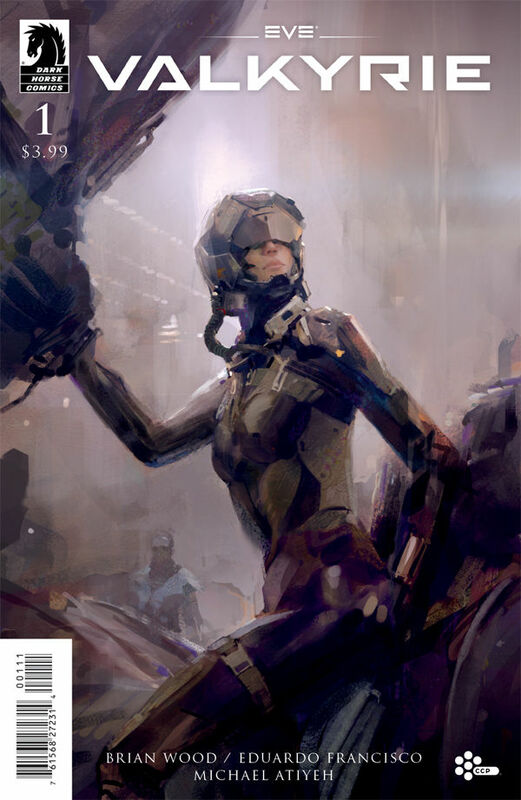 EVE: Valkyrie #1 offers value to readers who aren't too familiar with the EVE Online universe, as there are a lot of really interesting elements throughout the work. That being said, there is still something of a rote nature to Rán's story, as she maintains characteristics that make a lead character more interesting. Wood makes the book accessible and still manages to infuse it with a sense of duty. Francisco's illustrations are effective at showcasing space combat and provide a bit of a galactic flavor for the world of EVE Online. EVE: Valkyrie #1 is a book dependent on military scenarios for giving the main character plenty to contend with. EVE: Valkyrie #1 is in stores October 14.